Customer advocacy is a company-wide initiative – it’s an all-hands-on-deck approach that requires all of your front and back-end teams to pitch in and provide an unforgettable experience to the users. However, customer success managers are singularly responsible for guiding the customers throughout the journey, actively helping them exceed their business goals to turn the satisfied customers into loyal brand advocates. They help the users become more productive, extract the maximum value out of your product and provide a positive user experience that your customers will appreciate and reciprocate. Building a customer-centric product environment will not only help stabilize your MRR by retaining the existing customers, but the positive word-of-mouth generated will increase the referral rate leading to a dip in the CAC. If you break it down, their responsibilities cover a broad spectrum, starting with product training and onboarding to customer advocacy and retention. A customer success strategy encompasses the whole customer buying journey and technically, it never ends. They will help the customers realize more value in your products and services over time. They are aware of your customer’s goals and interests and pave the way for upselling and cross-selling opportunities. They engage with your high-value customers via touchpoints that define their journey towards success, thus lowering the churn rate. However, to blow your customers away with exceptional service, you need to align your entire team around a predefined set of customer success metrics and work towards achieving the goal. The CS team should collaborate with all the other units to chalk out a holistic and long-term plan that’ll not only lead to customer success but will also help you to move the needle in sales. The CS team is the customer-facing team who is in direct contact with the customers. They know the behavior patterns, goals, motivations, frustrations of the users better than anyone. Use this valuable information to identify the potential brand advocates and reach out to the look-alike audience. They can help the marketing team understand their usage pattern – how they are interacting with the product, why they are using it, what turns them into loyal customers, and also, what makes them churn. The marketing and sales teams can then work on an accurate set of buyer personas and craft the perfect marketing message that’ll resonate with the audience. By identifying the pain points and working on them actively, you will end up attracting the right audience and turning them into brand advocates. 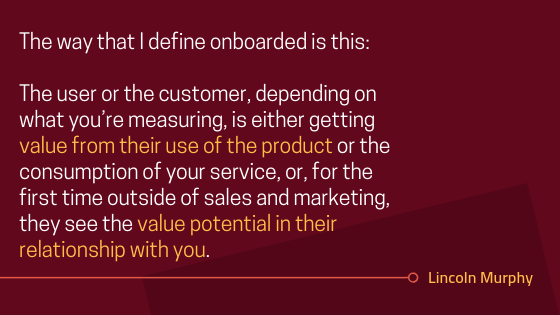 User onboarding is one of the most crucial touchpoints that sets the customer expectations from the very beginning. Help your CS team refine the entire process by keeping them aware of the user behavior prior to onboarding. The sales and marketing team can supply them with the insights gathered during the acquisition process (awareness and consideration stage), how they responded to the outreach attempts, and the conversation they already had with the team. This will help the CS team comprehend the customer’s needs and interests, and they can continue the conversation without missing a beat. Fostering a real relationship with the high-value customers requires a long-term commitment from your end. It’s not wise to rely on a single point of contact to take that relationship forward. Keep the communication channels open to maintain contact with the team members of the client company. Just as your lead generation campaign requires multiple touches via diverse channels, train your entire team to interact with the clients on various platforms. The CS team can do their job and guide the point-of-contact, but at the same time, the marketing team can engage with the other team members on social platforms and forums. With the help of social listening tools, the team can report any signs of displeasure to the CS team who can look into the specific account and help them out personally. The CS team can collaborate with the marketing team to come up with content for every stage of the user journey. The primary purpose of this exercise is to provide the users with relevant content when they need it the most. The CS agents can list down the common questions and setbacks that the users face while using the product. Here, the support team can also jump in with their own reserve of user queries and feedback. Once the opportunity areas have been identified, the content team can create and design training materials, such as learning guides, best practices, how-to articles, checklists, webinars, group classes, case studies, use cases, templates, demo and support videos, even personalized videos to welcome the user and set them up. Similarly, they can chalk up post-sales interactions such as transactional emails, cycle renewal communications, surveys, etc. This will not only make it easier for the users to hit the ground running, but it will also equip the CS team with helpful resources that they can refer back to at any given moment. Take a sneak peek at Twilio’s detailed tutorials to help the user set up at their own pace or Slack‘s smartly crafted product video that’s bound to catch your eyes. Once you’ve accumulated a good number of satisfied and successful customers, work with your CS team to form communities where they can interact with other customers, share their stories, and help them out. This inspires a feeling of exclusivity and keeps your loyal customers hooked to your product. Also, this will help the CS team to jump in and converse with the customers who need help and keep a track of the user sentiment. These niche forums can act as the referral points where the influential brand advocates can spread the word to invite more people over. Think of this community as a free training center, where you’re not providing the content or organizing the sessions. Here your existing customers keep the conversation going with your CS team as the moderator. Is this a viable option for small and mid-sized companies? Even though customer success plays an important role in retaining high-CLV customers, for small or mid-sized companies, it’s not always feasible to invest in a dedicated CS agent. 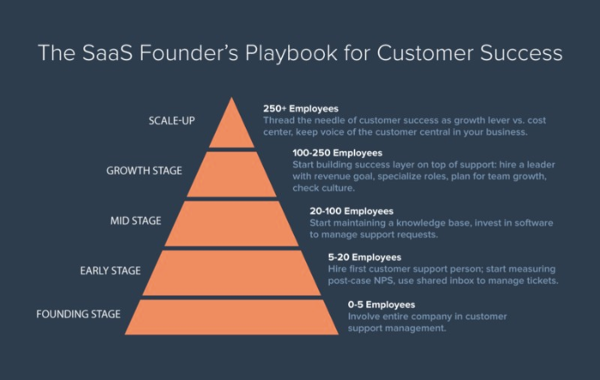 Hubspot’s playbook for customer success illustrates how you can incorporate customer success into your organization as your company scales up. In the earlier stages, the entire organization takes up the challenge of providing the customers with an end-to-end seamless user experience. I’ll break down the workflow using the example of how AppVirality works. Starting from lead generation to subscription renewal, the whole customer journey is mapped out at the very beginning. The challenge is to keep all the teams on the same page and work together as a unit. The key players are – Product Owner, Product Development Team and the Customer Support Team. First step: All the teams pitch in to establish the roadmap, identify possible touch points and content requirements. The content team sits with the development team to create the marketing materials and knowledge base keeping the buyer personas in mind. Second step: Once the leads are ready to convert, the support team onboards the users, answer their queries, train them, and solve any and all technical issues. They collect the FAQs, feedback, and suggestions and pass these on to the product team. They keep track of the progress and follow-up systematically to assist the users whenever necessary. Third step: The product team keeps all the gears running smoothly by working on the technical glitches and leveraging the customer feedback to roll out helpful, but looked-over features and updates. Fourth step: The product owner studies the individual customer accounts once every month and measures their success based on the target they had set at the early stage. They break down the monthly, quarterly, and annual goals and analyzes the metrics that clearly define success or failure. If required, they set up a meeting with the clients to discuss the progress chart and work on the shortcomings. The learnings are then passed on to the entire team for wide-scale adoption. According to Forrester data, 72% of businesses say improving customer experience is their top priority. Companies are coming to terms with the fact that a significant differentiating factor between you and your competitors is how you live up to the customer expectations by providing a smooth and delightful overall user experience. The success of your customers is directly equivalent to your success as a business, and you need to be their biggest supporters. 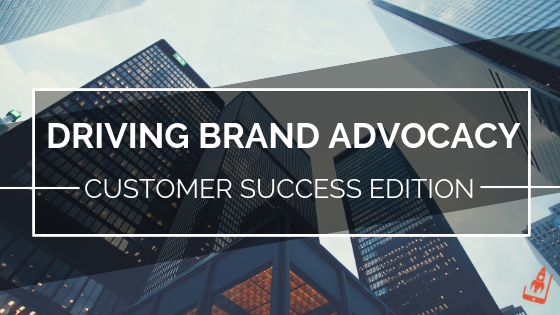 Customer advocacy isn’t won by just developing a quality product, it takes time and effort from your end to help your customers achieve and exceed their goals. An employee advocacy platforms allows employees to receive and post company-approved content to their social networks. Content is pushed out through a centralized hub, and since people trust their social contacts more than official marketing campaigns, they’re more apt to read, re-post and take action. Thanks for sharing a great article.